Red Cross Roadhouse volunteers in the kitchen at the Griffin Centre. Photo: Eveline Kuang. Being homeless is traumatic enough but it can also take a toll on a person’s self-esteem, mental health and the way they look, as well as detaching them from the rest of society. The Red Cross Roadhouse Program at the Griffin Centre is a beacon for the city’s homeless in need of a regular meal, support services, a sleeping bag or toiletries, and this Sunday (25 November) from 3-6 pm, the service is holding its second annual Community Day where its ‘clients’ can not only enjoy a range of different food but also freshen up with a shower, get a haircut, choose some new clothes and get one-on-one advice on their particular situation. 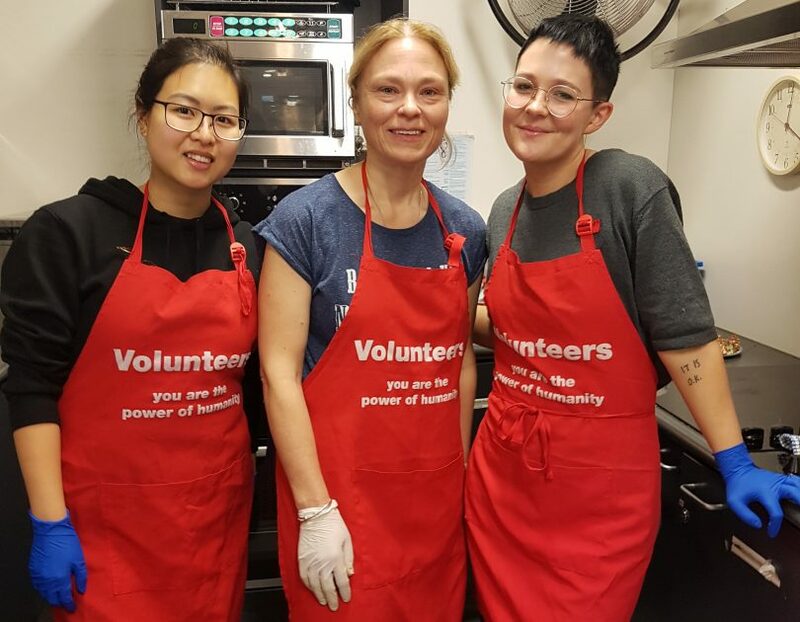 Roadhouse spokesperson Eveline Kuang said community groups, businesses and volunteers contribute their time and in-kind to the day which aims to bring the homeless and those at risk being homeless back into the fold and re-connect with society. She said it was a special day for the Roadhouse clients who would enjoy table service instead of the usual soup kitchen line-up. Local eateries are contributing meals but the Roadhouse is calling for more cafes and restaurants to come to the party so there will be a wide variety of food to cater for the expected 150 guests on the day. So far Zaab, Lazy Su, and Phat Panda are cooking for the day, with Gus’s cafe serving real coffee. Volunteers are providing desserts, and there will be a table of non-perishable food, kitchen utensils and other goods for clients to take away. Local barbers and hairdressers will bring their scissors and trimmers to offer haircuts and beard grooms, while OrangeSky will extend their usual Sunday stint to provide laundry and shower services. As well, clients will be able to take away fresh clothes from a table and rack of donated clothing and accessories. A photographer will be on hand to snap portraits and volunteers will arrange for photographs to be developed so clients can take them away on the day. Volunteers will also be offering legal, housing and other advice. “If there are any people having an issue we can send them in the right direction,” Ms Kuang said. She said last year’s event was a great success and the Roadhouse clients were looking forward to Sunday’s Community Day. Lazy Su + Zaab Street Food Andrew and Becky so nice to see you guys giving to the community!